Zak Ringelstein is a 31-year-old millennial with a big smile and even bigger goals. Currently the sole Democratic candidate running for US Senate in Maine, Ringelstein plans to change the face of American democracy by getting big money out of politics. But Ringelstein has more than just money on his mind. The left-of-center candidate is particularly concerned with something that is more traditionally thought of as a staple issue of the political right: The military and veterans. Having two brothers serve in the armed forces, with one still on active duty, the pressures faced by military families and veterans in transition hit home for Ringelstein. His concerns are something many Mainers can relate to because, with 1 in 10 residents having served in the military, Maine has among the highest number of veterans per capita in America. Ringelstein believes that when it comes to future conflicts, including potential wars with North Korea and Iran, America needs to explore every diplomatic option before rushing into solutions that will only continue to tax an already stretched military. He sees America’s role in the world as a champion of peace and freedom, not as a country that engages in never-ending conflicts. But if provoked, Ringelstein thinks America should fight to win. Concerned about the affects America’s long-term wars are having on the military population, Ringelstein also believes that veterans are owed better access to healthcare and help transitioning into civilian jobs when they hang up their uniforms. “We as a country owe it to the people who wear the uniform of our nation to not only have the best possible services while they’re serving, but the best possible services when they leave the military,” he said. Ringelstein’s dedication to, and concern for, men and women in uniform is in keeping with his salt-of-the-earth upbringing. Delivered on the kitchen floor of his childhood home in a small town in rural New Hampshire, he was born into a family of working-class public servants. Ringelstein describes a childhood grounded in community and faith, guided by parents who raised him and his three brothers to believe that service to something greater than the self is sacrosanct. With that lesson deeply ingrained, after high school, two of his brothers earned places at the US Naval Academy and joined the military. Ringelstein was off to Columbia University, where he decided that his own service would be as an educator in America’s public schools. After teaching at an urban elementary school in Phoenix, AZ that mainly served the children of immigrants, Ringelstein became disillusioned by the way public schools are funded and evaluated. He felt teachers were held to impossible standards, underpaid, unsupported, and then demonized as being lousy at their jobs. With their evaluations based on test scores, he saw teachers lose autonomy in the classroom and only teach to standardized tests–a form of instruction known as “drill and kill.” He watched the most talented teachers flock to affluent suburbs with enough tax dollars and support to ensure their success, leaving behind America’s most vulnerable children. He saw schools become privatized and profit-seeking in the name of reform, only to treat education as industry instead of service. What he witnessed made him believe that underfunding and privatizing America’s public schools not only strips educators of their calling as public servants but leads to further inequality in society as a whole. Determined to be part of a solution, Ringelstein went to Washington where he was invited by the Obama administration to help craft education policy. What he found was disheartening. “The entire conversation was incredibly shallow. I was the only person in the room who had ever worked in a classroom, and at the time, I’d only been a teacher for 4 years,” Ringelstein said. With a new administration in place and school choice lobbyist Betsy DeVos now at the helm of the Department of Education, Ringelstein is concerned that things are still not headed in the right direction–and it seems most Americans agree with him. In a recent Politico/Morning Consult poll, Secretary DeVos was revealed to be the least popular of President Trump’s cabinet members. 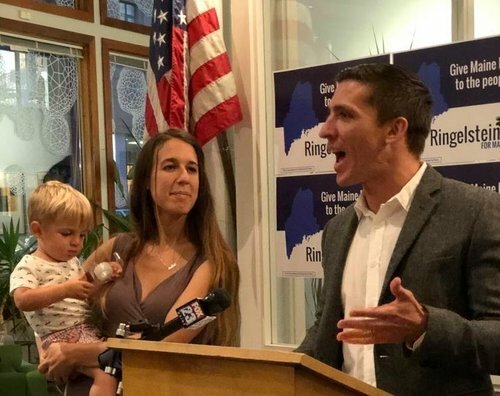 Be that as it may, Ringelstein chooses to remain optimistic, and instead of tossing up his hands in defeat, has elected to wade straight into the fight. As a Senatorial candidate, Ringelstein has set his sights on tackling what he perceives to be the root cause of a number of issues in America, including a disintegrating public-school system and a lack of aid for veterans in transition: Big money in politics. Citing a recent Princeton University study that shows a strong correlation between the will of lobbying groups and the policies enacted by legislators, Ringelstein is convinced that the amount of money pumped into politics by special interests results in legislation that does not reflect the will of the people, but instead reflects the will of corporations and lobbying groups that support elected representatives’ campaigns through Political Action Committees. To that end, he’s working on a people’s amendment to rescind Citizens United – the Supreme Court decision that affirmed money as equivalent to political speech, and paved the way for corporations, non-profits, and unions to use unlimited funds to support or denounce individual political campaigns. Ringelstein believes that without the pressure from industry and lobbying groups, issues such as healthcare, funding public schools, alleviating student debt, and veterans services could be dealt with reasonably and efficiently. His own campaign is financed solely by the donations of individuals, and he has even gone so far as to pledge 50 percent of all out-of-state contributions to community service projects throughout Maine. At a time of heightened political tension across America, Ringelstein is committed to reaching across party lines to represent the will of voters. When asked about the gridlock in Congress, he acknowledged the importance of making friends of legislators on both sides of the aisle, and restoring civility to the democratic process. Citing his experience as an entrepreneur, Ringelstein said that in business, he learned you have to listen to everyone and that building relationships is essential to getting things done. Ringelstein has a rather old-fashioned idea of what it means to be an elected representative: He thinks legislators should be beholden to the will of the people, and that includes constituents who don’t identify as Democrats.